Are We There Yet?? : I Found Yet Another Reason to Go to Salem! While perusing status updates on Facebook Friday evening I came across one from the Hawthorne Hotel which read, "Do you love history, and patriotism too?! Come to Salem on Saturday (tomorrow) to witness the Commemoration of the 374th Anniversary of the First Muster of the National Guard." Well, gee, I love history and patriotism! I also have a soft spot for men in uniform and seem to have a love affair going on with Salem, too, so it was like that status update was speaking just to me. Hmmm, should I or shouldn't I? As I sat mulling over whether a trip north to photograph the Muster and take Amanda to lunch might be a good idea, I received a message from Juli (the sainted woman who saved the day when Amanda was having roommate problems at Montserrat) making the prospect even more tempting in the form of an invitation to dinner at her house. Amanda had absolutely raved about meals at Juli's house as well as how funny Juli's husband Walt is so couple that with the chance to spend more time chatting with Juli herself and my decision was pretty much a done deal. It really locked into place when I was offered the chance to stay at the Hawthorne again as you know what a sucker I am for that place! Alright then, Jamie and I were heading to Salem bright and early on Saturday morning! A few messages back and forth had my plans all set so the only thing left was to get to bed so that I could get up at 6:00 in order to be out the door at 7:00 being that the Muster began at 10:00 and I wanted to make sure we were there in plenty of time. 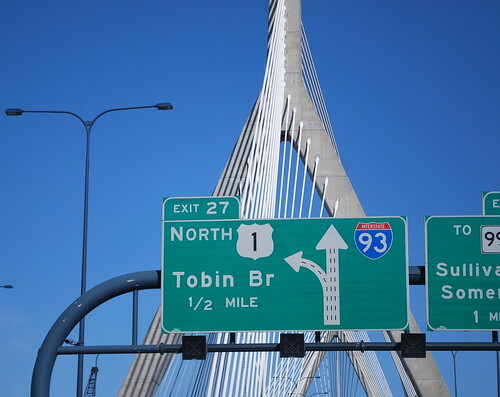 Fortunately the weather was bright and sunny when we left (even though we're still looking for more spring-like temperatures) and with it still being fairly early and traffic not being bad, I decided to take an alternate route to my usual drive up to the North Shore and drive up through Boston via Interstate 93 rather than taking the Mass Pike which gets real old real fast! 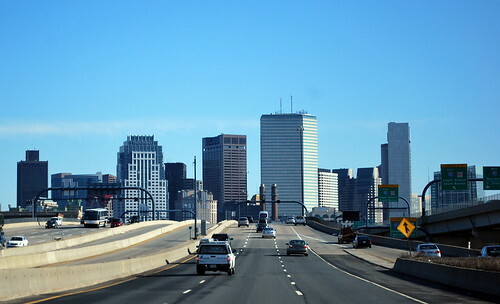 As we approached Boston itself I asked Jamie to take a couple of pictures which she grudgingly did. I don't get it ... if I were a passenger I'd probably be snapping pictures all the time but alas neither of my two kids seems to appreciate it when I ask them to take a few shots! Probably because it takes their attention away from changing the song on the stereo! With four new tires on the car, I practically sailed to Salem (Memo to Self: it's too easy to drive too fast on new tires so watch it!) 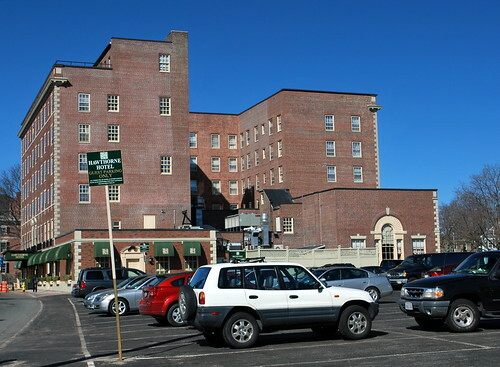 and we arrived in town before 10:00 a.m. First Muster would eventually wind up on Salem Common which is directly adjacent to the Hawthorne Hotel so I decided that parking there would probably be my best bet however, being that the lot is reserved for guests of the hotel and a parking permit is required to be displayed I decided I'd pop into the hotel to see if I could get my permit early so that it would be okay to park there. Much to my delight, not only was I able to get my parking permit but I was also able to check in early as our room was ready. You have got to love a hotel that will let you check in before 10 a.m.- a good six hours before the usual 4 p.m. check-in time! Being that the Hawthorne is doing some major renovations with their bathrooms and forty rooms are currently under reconstruction, for this visit Jamie and I were going to be doing something completely different and spending the night at the Suzannah Flint House which is a historic Bed & Breakfast-style property located to the rear of the Hawthorne's parking lot. 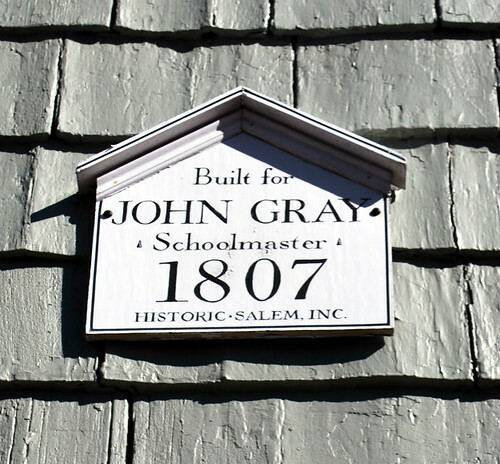 The Hawthorne acquired the historic 1807 property that once belonged to Salem Schoolmaster John Gray in 2003 and offer it as an alternative to the main hotel for guests that like a more intimate feel. If you'd like to read more about the house's name, please follow this link over to the Hawthorne Hotel's blog for more information. 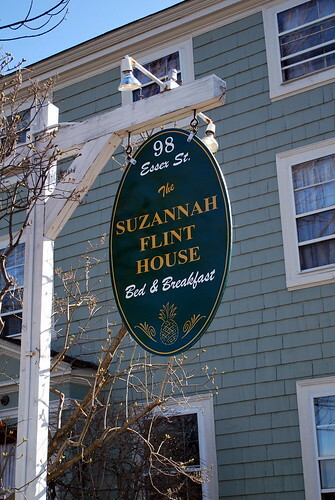 It does make me wonder why it's still called the Suzannah Flint House and not the Fidelia Bridges house though. 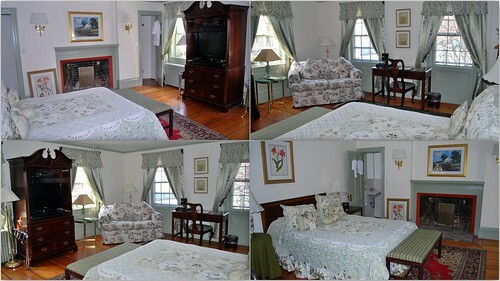 The house has four rooms for guests - two upstairs and two downstairs; Jamie and I would be staying in the "Garden Room" located on the first floor of the house. Our room was quite lovely as well as sunny and bright - I loved all the windows! - and trimmed in one of my favorite colors, a soothing green. 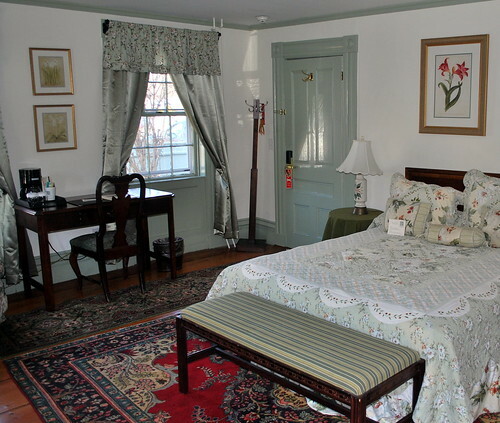 The antique wide pine floors are covered in Oriental rugs and each room has a decorative fireplace along with a queen-size bed and a sofa sleeper and are quite roomy. There's also free internet and cable television for those that can't go without the modern conveniences. We never turned the TV on but Jamie wasted no time in making sure that the internet worked! 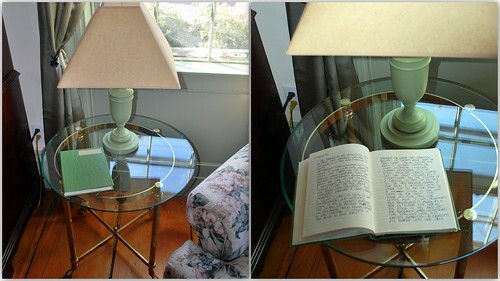 On a small table next to the sofa bed, there was a journal available for guests to leave a message for those who came after them and even though I forgot to write a passage myself, I did enjoy looking through to see what others had written. One of the latest entries was about four pages long and quite interesting! As I've found from my previous stays in the main hotel, the bathrooms at the Hawthorne definitely add to the uniqueness and charm of staying at a historic hotel but they may not be exactly what a lot of people appreciate (which is probably one of the main reasons that they're undergoing major renovations right now). The bathroom at the Suzannah Flint House was no exception as it was divided into two "water closets" as it were. The shower closet was pretty small - so small in fact that there was no way that I could even take a picture! - but the shower itself was great as I found out on Sunday morning. Lots of hot water and really good pressure so even though it was probably akin to taking a shower in a phone booth, I didn't really mind it. The rest of the bathroom was in another "closet" and had what is probably the smallest sink I have ever seen! The term "Doll's House" came to mind several times in regards to the bathrooms but considering that when the house was built indoor plumbing was right up there with space travel, it's understandable that the bathrooms are as tiny as they are. For me, it adds to the charm and they're certainly more than functional but again, that may not be everybody's cup of tea. Guests that stay at the Suzannah Flint House are welcome to use all of the amenities of the main hotel which is not far away at all - I'd say a stone's throw if you've got a good arm! 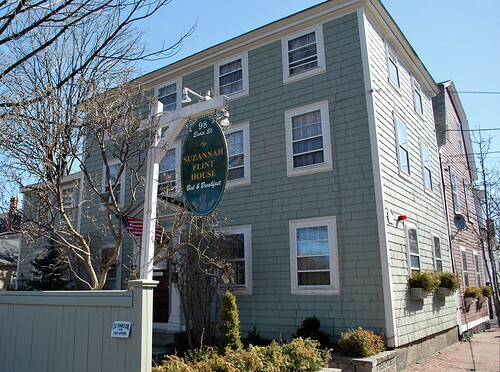 - but with the exception of taking Amanda to lunch at the Tavern on Saturday afternoon, I only popped in and out long enough to check in and check out. Even for just those short transactions, though, the staff was its usual friendly and helpful self and I felt like I was visiting family and not just spending the night at a hotel. I know I've said this before but it bears repeating that part of the big draw for me at the Hawthorne is the way the staff makes me feel when I'm there. They go out of their way to make sure that everything is as close to perfect as it can be. The Hawthorne is one of the most guest-friendly hotels I have ever stayed at and I'm not just saying that because the General Manager has become a friend, I'm saying it because it's true! Honest - she really is under there somewhere! 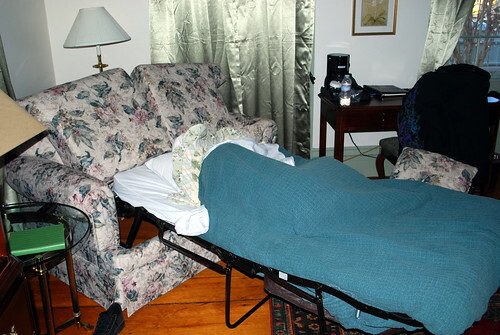 She had told me Saturday night that she wasn't too sure how comfortable the sofa bed was going to be so if I woke up to find her sleeping next to me to not be surprised but it turns out that the pull-out bed was quite comfortable and I had to nudge her awake around 9:30! 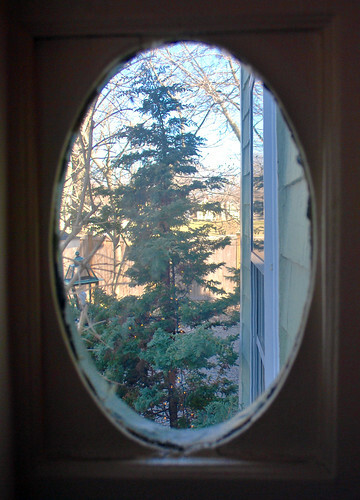 All in all I had yet another wonderful stay in Salem thanks to the Hawthorne. I really think I'm getting spoiled for any other hotels, though! As soon as I can get the pictures sorted through I'll be posting about our "real" reason for going up to Salem this weekend which was the 374th Anniversary of the very first muster of what turned out to be the National Guard - something that was pretty cool in my history-loving book! For now though I'll leave you with a sneak peak at that post. Oh, and did I happen to mention that I have a soft spot for men in uniform? Oh wow, I love that room. So pretty! It does look comfy and cozy. bright and cheery too! I love subtle misty green with the red carpet. I'll bet that ceremony was fun to watch. Who can resist a good looking man/woman in uniform? What makes it even more awesome is the friendship you and Julie have built. That capped off a perfect weekend. 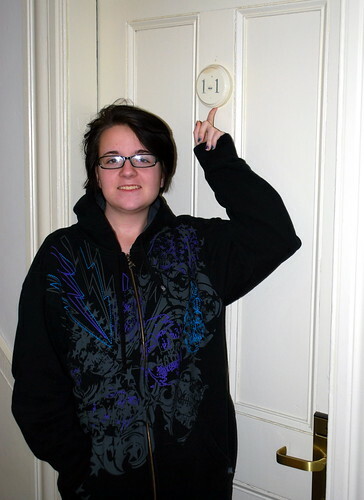 we have only stayed in one hawthorne inns and suites but loved it and have gone back several times. it's in rome georgia. huge rooms, lovely! I love the decorating... I wonder if their decorator would care to come to the swamp and do my bedroom? Love all your photos Linda and Jamie did well with the photos she took as well. Beautiful! I would love, LOVE to stay there. Srsly. Another great post! Nice digs! I'm anxious to see/read about your next post. I don't know a lot about it and am very interested! 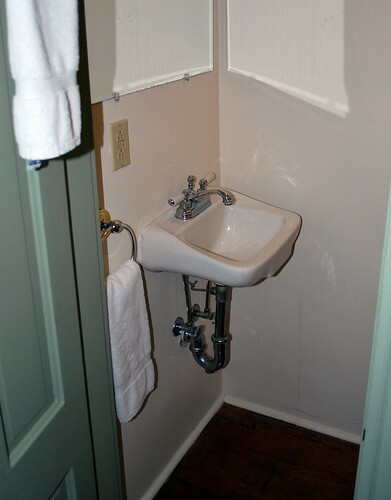 Your description of the "doll house" plumbing reminded me of a B & B in Baltimore that was up a steep flight of stairs above an historic pub. The room was just wide enough for a day bed, tiny table and wardrobe. The "facilities" required sliding in sideways to enter the shower. :-) I loved it, but others might not have appreciated the charm. I enjoy your enthusiasm for these kinds of weekends. 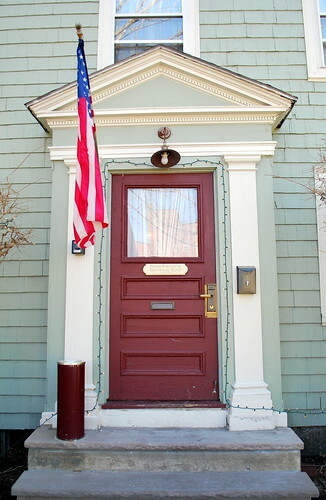 Salem looks so wonderful, as does the house and everywhere else. You give me the wonder lust every time I visit. No exception here.